Where are you from? Your profession? I was born and raised in Melbourne, Florida, and currently live in Williston. 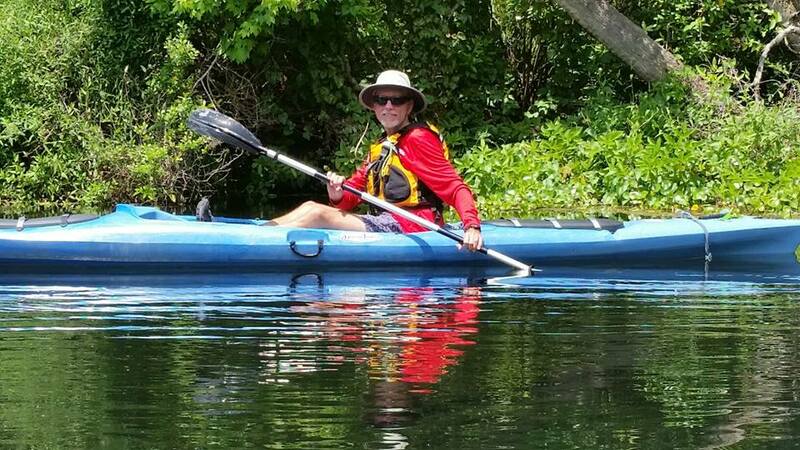 I’m the owner/guide/instructor at Wild Florida Adventures, providing kayak and hiking day tours since December 2002. I also provide classes at Santa Fe College in Gainesville relating to the outdoors. When and how did you become interested in paddling? In the summer of 1963, I became exposed to canoeing via the YMCA summer camp in Brevard County. I’ve paddled the waters of the state since then, switching over to kayaks in 2000. Where is your favorite place to paddle? That is like asking which is your favorite child! I love all waters whether fresh or salt, though I do especially like the coastal estuarine environment and visiting offshore islands. What’s the most interesting thing that ever happened to you on a paddling trip? Observing wildlife and nature in all of its forms. Seeing a species, whether plant or animal, for the first time while paddling. Encountering the unexpected is always a thrill! Explain your Paddle Florida role and which trips you’ve gone on so far. I’m a volunteer who helps with the daily operation of the Paddle Florida events on the water as a guide and on land running the lunch van, filling water containers for the guests, or even the wash station. I’ve been on the Withlacoochee (Gum Slough only) 2014; Florida Keys Challenge, Great Calusa Blueway, Ochlocknee River Dam to Bay, and Suwannee Paddling Fest in 2016. Can you describe a Paddle Florida trip highlight? One highlight was the Florida Keys Challenge, leading the group every day, paddling the crossings from island to island, and immersing myself in the local environment by exploring the beaches and campsites. The music was great too (Bing Futch! ).